Throughout Alaska, agencies are recognizing the important role search and rescue dogs play in locating lost or missing people. ASARD was formed in 1987. The three tables below illustrate the mission activity of ASARD dog teams over the last eight (8) years. Since 1996, ASARD teams have responded to 394 search and rescue missions across Alaska. On average, ASARD teams are called upon every two weeks to help locate lost or missing individuals or approximately, 25 searches a year. Together, wilderness and urban searches have accounted for 61% of ASARD’s missions. Moreover, the need for cadaver and water capable dog teams is strong, as noted by 79 missions or 21% of search activity. ASARD teams are requested throughout the year for cadaver and urban searches. In Winter & Spring, avalanche searches and mission support comprise the bulk of ASARD’s activity. In the Summer & Fall months, efforts are more focused on wilderness, and water searches. Urban searches seem to be spread somewhat evenly throughout any given year. 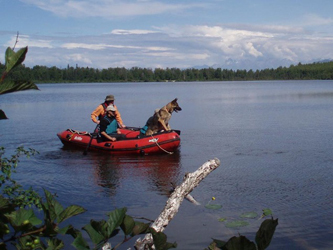 As part of successful inter-agency responses into the backcountry, ASARD dogs contribute to the recovery of many lost or missing individuals. • Avalanche searches decreased by 65 percent. • Wilderness searches decreased by 43 percent. • Wilderness searches comprised 50% of total searches 1996-2003 and only comprised 30% of total searches 2004-2010. • Urban searches increased 400% and comprised 35% of total searches, outpacing wilderness in total searches (30%) for the 2004-2010 time period. • Water searches increased 50%. All organizations, including ASARD, need to adapt to the evolving and changing requests for search dog teams from state, federal, and local agencies. ASARD’s continued mission is to provide proficient and reliable dog teams that meet these requests.